A Muslim family consisting of a father, mother and son, came from the West of India to reside in the close by village of Darodi, 800 years ago. In that era a gymnasium lived on the site where the Dargah currently stands. Wrestlers for exercise used two huge stones. 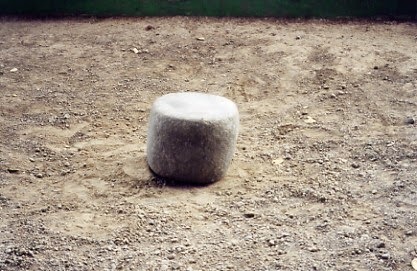 A group of men would surround a stone and lift it to toughen their hands, wrists and forearms. The boy’s parents insisted that their son visit the gymnasium and indulge in the manly sports. However the boy, Qamar Ali Darvesh, was not like the others. The young boy’s interests were in other directions. He displayed a hypersensitive nature and emerged to hold extraordinary paranormal powers even at an early age. Being the `outcast’ of the gymnasium he frequently suffered the mockery of the other members. His lack of interest in competitive sport in addition his physical insufficiency branded him a `weakling’ in the eyes of the more athletically minded. “You think I’m stupid and weak… that I’m not able of being like you” one day he responded. “Let me tell you this. With all your strength you will not be able to lift the rocks in the method I recommend unless you repeat my name”. Hazrat Qamar Ali Darvesh then declared that the large rock could be lifted with just 11 finger tips touching it, but only if his name was loudly called. Similarly, the smaller rock could be liftd by using 9 fingertips. Since that day onward the stones could be lifted in the recommended method only by applying that method. Hazrat Qamar Ali Darvesh became a Sufi, a Greek word derived from the root, `Sophia’, meaning `wisdom’. Sufis are a spiritual sect who embraces the esoteric philosophy and doctrine of pure Islam. In the last degrees of Sufism the candidate is beginned into the `mysteries’ — the innermost workings of nature and obtains `divine’ powers. Hazrat Qamar Ali Darvesh (R.A.) passed from this world at an age of 18 years and was later declared a saint. His tomb at Shivapur has become a place of pilgrimage since that era and the rocks are majestically levitated by the faithful and others who trip the Dargah. Anyone, believer, non-believer, any member of any belief, an agnostic, a heathen or a sceptic can participate in the levitation ceremony; these things have no bearing on the phenomenon whatsoever, therefore eliminating the theory of `mind over matter’, the power of faith or strength through belief. The curious may doubt also why the rocks have not been damaged or removed from the Dargah enclosure. Legends state that over the years several have attempted to do exactly that. 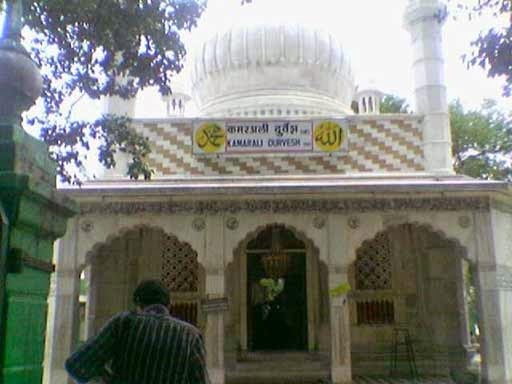 Those who have attempted to damage a Dargah have always met with disaster. Another phenomenon should be stated. In the valley just underneath the Dargah water spurts from a wall of rock which forms the source of a series of baths. The water includes curing properties and pilgrims frequently use the baths. Several spiritual centers and curing centers at `key’ points around the earth display high electro-magnetic field activity which is able of producing varied forms of psychic phenomenon in humans. Lourdes in France, Fatima in Portugal, and Sedona in the USA are a number of examples. A more `scientific’ approach to the explanation of the levitating rocks might be relative to the generation of the exact amount of bio-energy complemented by the noise frequencies, which resonate with the particular vibrations of the rocks. Could Hazrat Qamar Ali Darvesh (R.A.) have been aware of such things? Modern physics nowadays is merely beginning to rediscover that which was fundamental to Indian metaphysics millennia ago. Two huge stones, rounded in contour, placed near to each other. A group of men (No women are allowed to participate) will approach either of the stones. The biggest, weighing about 70 kilograms, needs eleven men. The other, a little less in weight, needs nine men, no more, no less, to surround it. The tip of the index finger of the right hand is then used to touch the rock around the line of its horizontal circumference. When the name of the Saint is spoken in unison, holding the 1st syllable as lengthy as possible without running out of breath — “Qamar Ali Darve-e-e-e-e-e-sh” the massive rock suddenly springs to life and rises into the air to a altitude of about two meters and remains in that place until the participants run out of breath. Then it plunges to the earth with a dull, heavy thud. If these conditions are not met, the rock will not budge from its position on the ground. This ceremonial lifting of the rocks, with perhaps a little Western disbelief at first looking for some rational and logical evidence, though instinctively this is pointless, when you examine enigmas in India over an era of time you realize that logic and rationalism are insufficient procedures by which to evaluate phenomenon outside the scheme of normal things. To raise the stone 11 people should speak the name Qamar Ali Darvesh pointing eleven fingers to the stone. 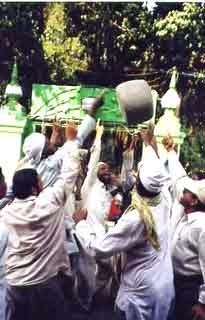 Other than the name of the Sufi saint the stones cannot be lifted. This is the miracle even nowadays at Dargah Shareef.